Party: Mum, Dad and I The drive west toward Capitol Reef was spectacular. Black mountains beckoned at every turn. Remains of their crumbling faces gathering in large piles at the base, spreading out like sand dunes from another world. I would have loved to explore the hidden secrets, watching the various moods as light played across the landscape… My eyes thus entertained the drive went quickly and the waterpocket fold that is Capitol Reef soon loomed before us. The waterpocket fold is the longest exposed monocline in North America: a one sided fold with one steep side in an area of otherwise horizontal rock layers. We entered the park on a winding road through a wide canyon. I looked up at the peaks and domes above; the drizzle we’d experienced overnight had fallen as snow here. The light dusting providing great contrast to the red sandstone. The fruit orchids (branches now bare of leaves) looked somewhat out of place. Their neat rows and neighbouring campgrounds somehow too orderly and manicured. Passing a couple of unbelievable cottonwoods we turned down the dirt road that followed the Grand Wash for a ways before it terminated at the parking lot. We packed and wondered down the canyon before taking the trail that climbs up the canyon wall via a series of benches and switchbacks. The arch soon appeared. Cassidy arch on the approach. Crossing the slickrock we were soon peering down into the large hole created by the arch. Walking around, we crossed over the arch a couple of times before dropping down beside the arch. The view of the arch from the bottom was even better! We were lucky we were just below the snowline as the traverse to the next anchor would have been nearly impossible. Dad rappelling down beside the arch. Mum rappelling the second pitch, just below the arch. Several more shorter pitches followed. Two of them through small natural bridges. The anchors were all bolted; one of them was very poorly placed making the drop trickier than it should have been. Dad descending through the first natural bridge. Mum descending through the second natural bridge. 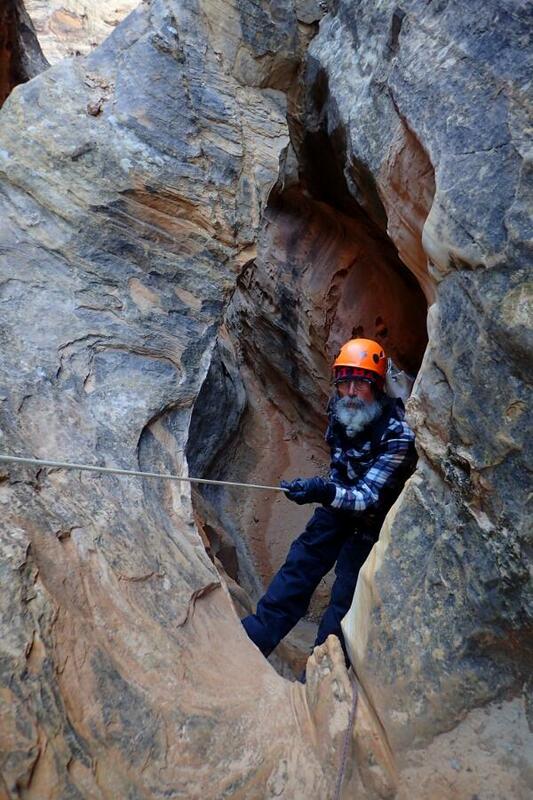 To reach the next anchor steps had been cut into the side of the canyon, an old steel cable fixed as a handline. Rounding the corner a wooden bridge spanned the gap to the other side. 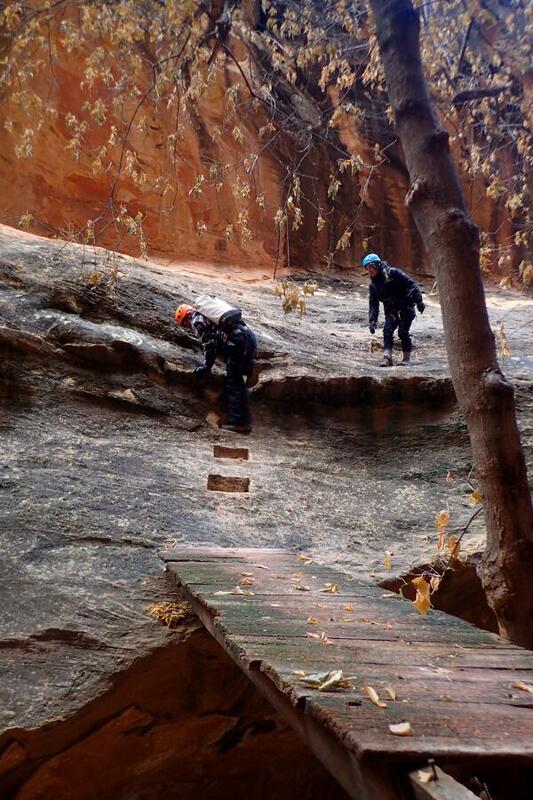 Apparently before Capitol Reef became a Park (in 1971), locals tried building a route up to Cassidy Arch though the canyon, building bridges and cutting steps into the rock… the bridge looked rickety but it held as we one-by-one tiptoed across (you can rappel if desired). Descending the old stone steps that drop to the old bridge. One more drop followed and then it was an easy walk back to the car. What a great half day trip! Very scenic! With some time still up our sleeve we visited a few lookouts before making camp just outside the park boundaries.